In my last post I wrote about Dawn Sokol’s on-line class called 12.31 Art Journal. I’ve made a lot of progress the past two days. Today I finished up the canvas cover for the journal. This was created on a piece of green duck canvas about 10 inches by 13 inches (I wanted to use up what I already had on hand). I covered it with a coat of gesso, let that dry overnight and then painted the whole piece using three shades of pink that I mixed. (I used Claudine Hellmuth’s Studio acrylics because they have a hint of gloss to them when dried). 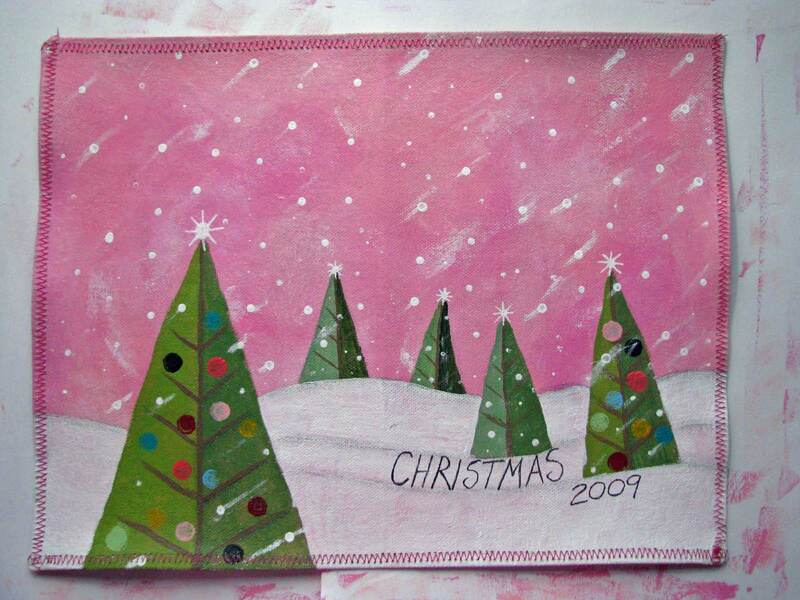 Once the pink background dried I then sketched the scene of three snowy hills with Christmas trees. I applied dots of white paint to simulate snow and them smeared them to look like it was really storming and windy as the snow was falling. I used my sewing machine with a heavy-duty (#18) needle and sewed a zig zag stitch to hem all of the sides. The finished size is 9 inches tall by 12 inches wide. When I fold the cover in half, the page size will be 6 inches by 9 inches – a perfect size to carry with me. I had planned to add some 3-D embellishments but decided to leave it as is (at least for now). Another tradition has begun. Tomorrow I will be collecting the pages to make signatures and then sewing them into the journal. Stay tuned for more. I hope to have some graffiti covers and papers to show you soon from Mary Ann Moss’ – Stencilry class. Check out her blog – Dispatch from LA – very cool. Merry Christmas. Keep it simple and start some new traditions. That’s AWESOME, I LOVE it! The colors are lovely….Love the pinks you used in the background. GREAT job!!! and sewing in the papers. I’m very excited to show pics of it tomorrow. Talk to you later.